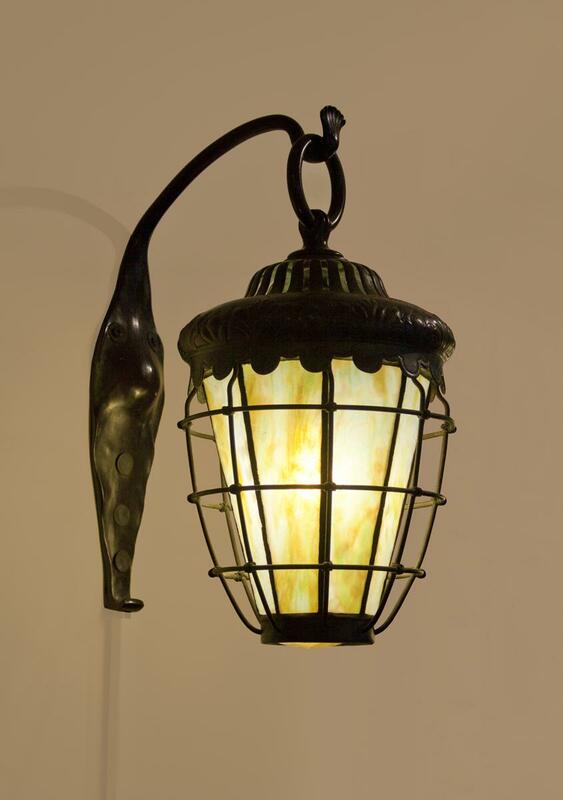 This lantern is one of a pair of Tiffany Studios lanterns which were a special commission for a home in eastern Pennsylvania, possibly unique. Each lantern comprises a decorated and reticulated bronze bonnet with a fitted and 8-sided conical shade of leaded mottled glass, the bottom with gold iridescent turtle back glass inset tile. The shades are encased in metal cages and are suspended from bronze foliate arms in rich brown/green patina. These lanterns were intended for use as exterior lighting in area protected from the elements.